Takeaway: Our Financials analysts will be in studio today at 10am ET to offer up fresh perspective on the payments space and its largest player. Editor's Note: If you are an institutional investor interested in accessing this call or related materials send an email to sales@hedgeye.com. As part of a new, exciting initiative at the Hedgeye Financials team, we will be taking on the large and still growing payments industry, offering fresh perspective and a detailed contextualization of the the risk and return profiles underlying the various players in the space. As we embark on a thorough coverage of the entire ecosystem, from merchant aggregators and acquirers to the big card issuers, we begin our journey with the largest players in the space, the card networks. 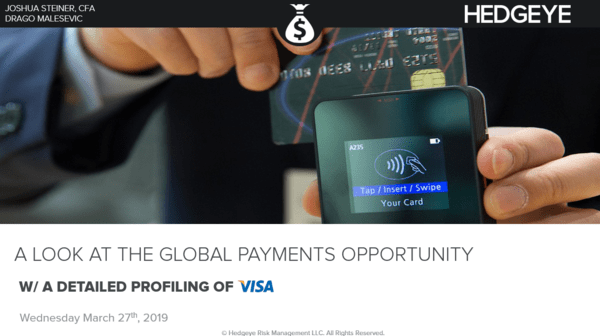 Accordingly, in addition to an overview of the broader payments landscape, our inaugural work will be centered around a robust, methodical multi-duration analysis of the largest card network, Visa Inc. (V). With no shortage of well-founded optimism fueling the rise in Visa shares, we felt it was necessary to develop a comprehensive reference framework to fully quantify the risk and return potential facing the stock based on the business' existing set of competitive advantages and the pressures, from a changing industry landscape, on its dominant industry position. The case for the upside is well-known: Visa is a free cash flow machine driven by a capital-light, high margin, inflation-proof business boasting both geographic and product diversification, size and scaling advantages, a strong balance sheet, and secular tailwinds abound. However, despite its persistently high positive sentiment, no business is without risk. What is to be said about the firm's strong dependence on high-margin cross-border revenues which could be met by downward pricing pressure from competition and regulation? Exactly how large are the lauded China and India opportunities? How concerned should investors be about contra-revenue drag from growing client incentives? Exactly how much secular runway is left? Will slowing secular growth embolden other players in the space to put pressure on Visa's economics? Our analysis aims to both centralize and standardize this discussion, providing a rigorous, probability-weighted set of conclusions for investors to form sound long-term expectations around as they look for the best and most efficient way to risk manage their positions among the card networks, and in particular, Visa. In addition to our long-term view, we will be providing intermediate and shorter-term frameworks, based upon Hedgeye's overarching quad model and our proprietary AI-driven stock selection tool, on how to trade the stock.